In 1967, at the tender age of five, I left Liverpool for good. Shortly thereafter, the city fell into a sharp and steady decline from which it has never fully recovered. I'm not suggesting my departure was the cause of Liverpool's woes, but I've never been able to shake the feeling that if I'd stuck around, things might have been a little bit better. Things could hardly have been worse. At the end of the First World War, more than one-seventh of the world's shipping sailed out of Liverpool. A mere fifty years later, the government was seriously considering a plan to turn the dockyard into a parking lot. Once Britain's second city, by the mid-'80s, Liverpool was flat broke. Jobs were so thin on the ground that soccer fans from the South would taunt Liverpool supporters by re-writing their team anthem You'll Never Walk Alone as You'll Never Work Again. Across the country, the word "Liverpool" had become a synonym for crime, unemployment and urban decay. Those who could afford it moved south in search of work. Those who couldn't, stayed home and learned to grin and bear it. 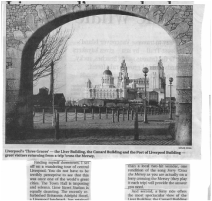 Today, thanks to a massive infusion of redevelopment cash, Liverpool has a lot less to bear and a lot more to grin about. It's not exactly a boom-town and, unlike the rest of England, every second business isn't covered in "help wanted" signs. But it's definitely on the mend. The docks have been scoured, scrubbed and turned into an interesting collection of museums and boutiques. The city center has been cleaned up and partially made over. And many of the city's derelict buildings and abandoned warehouses have been converted to upscale apartment blocks, providing a luxurious living environment for the sort of people who don't read much, but know an awful lot about wine. I couldn't wait to see it. But first I wanted a beer. Fortunately from Lime Street Station (where I'd arrived on a train that had run out of beer and been forced to serve Heineken instead) it was but a short walk to Doctor Duncan's pub. It's a beautiful place and the house ale, produced locally at the Cain's Brewery, is amongst the finest you'll taste in all Britain. And unlike Liverpool's more famous pub, The Philharmonic, John Lennon never drank there, so the place isn't filled with guidebook-toting tourists dressed in "Fab Four" t-shirts trying to remember the words to Penny Lane. And on that note, let's talk (briefly) about the Beatles. Liverpool's tourist literature goes on and on about the Beatles and by the time I arrived I was heartily sick of them. But when you get there, it's all rather restrained. There's a museum. There are various companies offering various Magical Mystery Tours. And you're never far from a selection of tacky souvenirs and t-shirts. But, all-in-all, it's not too bad (and not nearly as bad as I'm sure it would be if, say, Elton John had grown up there). I took a quick look at the museum and signed up for one of the tours. The museum was a bit like watching an A&E Biography and the tour was a bit like watching an A&E Biography while riding in the back of a minivan. But I did pick up a few nifty pieces of Beatles trivia, which I was careful to note down because you never know when you'll need to pad out a travel article. Did you know that the bank at Penny Lane made famous by the lyric "… and the banker never wears a Mac …" is today managed by a man named Macintosh? Did you know that John Lennon's boyhood home is currently on the auction block and the highest bidder so far is pop singer George Michael? Did you know that none of the sites mentioned in the song Penny Lane are actually on the street itself (It is a little-known fact, which I just made up, that the original song lyric was "... the area surrounding and immediately adjacent to Penny Lane there is a barber selling photographs ..." but John and Paul later shortened it.). Did you know that this travel article is now nicely padded out and if you want to learn more about the Beatles you'll have to watch A&E, 'cause that's all I'm going to tell you? I'm sorry. I didn't mean to slag the Beatles. They were a decent band and a nice bunch of guys and even today Paul McCartney makes a point of coming back to Liverpool and helping out the old hometown (which is jolly nice of Sir Paul, so let's all forgive him for Mull of Kintyre, shall we?). But what makes Liverpool so fascinating is not the Beatles, it is the sea. And for that story, I headed down to the Albert Dock. It was cold, rainy and windy, and walking along the dock I could easily conjure up mental images of Liverpool's glory days when ships arrived from all corners of the world carrying everything from spices and tea to coal and rum. With a bit of imagination, it wasn't hard to picture the Albert Dock alive with the hustle and bustle of seaborne commerce. And having done that, and gotten myself thoroughly drenched in the process, I headed indoors. I wasn't terribly impressed with my first stop, the Museum of Liverpool Life. It's one of those modern, touristy museums designed for people who watch a lot of TV. Filled with ordinary items from everyday life, it appeals to people who bring their families and spend the entire visit pointing to old toasters and washing machines and telling bored kids that "Grandma had one of those exact things in her kitchen," (which says a lot more about the museum than it does about Grandma, if you ask me). But if Liverpool Life disappointed, the Merseyside Maritime Museum more than made up for it. I spent hours in the place and actually went back for a second visit (and as someone who devoted a full 27 minutes to Westminster Abbey, that's really saying something). It's a gem, and more to the point, it tells you more about Liverpool than any collection of Grandma's toasters or Beatles memorabilia. The first thing you see is an endless film loop showing the view from a WWII destroyer patrolling the North Atlantic. It's nothing fancy — no 3D, wide-screen, IMAX tomfoolery, just a black-and-white camera bolted to the bridge of a ship and left to run — but it's hugely compelling and drives home the fact that the sea is a nasty, harsh and brutal place. There's so much to learn at the Maritime Museum and if I hadn't padded out this article with worthless trivia about the Beatles I'd have space to tell you more about it. But I must mention the SS Peleus. A cargo ship, it was built in Liverpool and owned locally. In 1949 when the Peleus was launched, fully one-in-five Liverpudlians worked in the shipping business and Liverpool firms owned and operated more than 600 commercial ships. In 1972, just 23 years later, the Peleus was sold to a company in Taiwan and broken up for scrap. Today, the ship is gone forever and all that remains is a replica on view to tourists. If the Peleus isn't a metaphor for Liverpool, I don't know what is. There's plenty more at the museum including a Slave Gallery which puts paid to any romantic notions that sea commerce was confined to tea and spices, an emigration exhibit covering the experience of the nine-million people who left England, via Liverpool, for the New World, and a host of models, pictures and artifacts from the glory days of the transatlantic luxury liner. From the dock, I walked into the city center to the Western Approaches Museum, which, to my crushing disappointment, was closed. I'd read about this place and was dying to see it. Buried in a bunker beneath a nondescript office building, this was the Allied secret headquarters during the Battle of the Atlantic. It's been preserved exactly as it was at the end of the war and when I return to Liverpool (as I most certainly shall) it will be my first port of call. Finding myself downtown, I ambled over to Doctor Duncan's pub, made yet another substantial contribution to the financial well-being of the Cain's Brewery, and set off on a wandering tour of central Liverpool. You don't have to be terribly perceptive to see that this was once one of the world's great cities. Town Hall is imposing and solemn. Lime Street station is, in a quite different way, equally daunting. The Adelphi Hotel has retained much of its old grandeur (though the corporate cretin who put "Britannia Adelphi Hotel" in five-foot-high letters across the hotel's frontage deserves a sharp kick in the backside). And the neo-classical St. George's Hall would not look out of place in London, Rome or Paris. Nor would the Sessions House, which, by the way, played the part of Soviet Naval Headquarters in the film The Hunt for Red October (never let it be said that my articles aren't simply chock full of interesting facts). There's even a statue of Queen Victoria in which, from a certain angle, she appears to be sporting — how shall I say this? — a particular physical appendage more appropriate to a Victor than a Victoria. By the time my wanderings had taken me back to the dock area, I was madly in love with Liverpool. So madly, in fact, that I actually decided to take a ferry 'cross the Mersey. I knew it would be the lamest thing since Brooke Shields' acting career, and it was. But I'd do it again, for two reasons. First, if you've ever wondered why the Beatles became hugely rich and internationally famous while Gerry and the Pacemakers languished as little more than a local two-hit wonder, one rendition of the song Ferry 'Cross the Mersey will provide all the answer you need. And second, a ferry ride offers the most spectacular view of the Liver Building (rhymes with diver), the Cunard Building and the Port of Liverpool Building, known collectively as "The Three Graces." They are a wondrous trio, but of the three, the Liver Building is the most spectacular. Two 18-foot-high copper Liver birds crown this edifice and locals say the outmost bird represents Liverpool women looking to the sea for their returning men folk while the innermost bird represents thirsty sailors looking towards the city to see if the pubs are still open. I left the next day and soon found myself in a pub in downtown London. Chatting with the bartender, I was pleased to see that Liverpool no longer conjured up visions of strife and urban decay. "I hear it's really nice up there," the barman said, when I told him where I'd been. "It is," I replied. "Liverpool is a beautiful city." And then for no particular reason save pride, I added: "I was born there, you know." Ottawa writer Mark Hill loves you yeah, yeah, yeah.